During our monitoring work last week we found a barn owl in a recently re-located box. Nothing unusual in that, except on approaching the owl, it was completely still, in fact we thought it was dead. As we got a little closer to the owl inside the box it moved but didn’t look quite right. We removed the owl from the box for closer inspection. It was an adult male and in moult, this probably accounted for the initial lethargy, moulting burns a lot of calories, so it makes sense for the owl to expend as little energy as possible What made this particular male unusual was the fact that it’s right eye was missing and the orbit had healed. This doesn’t seem to have been much of a handicap for this male, as it’s weight was good, it was holding the nest box and was probably moulting after rearing young this year. 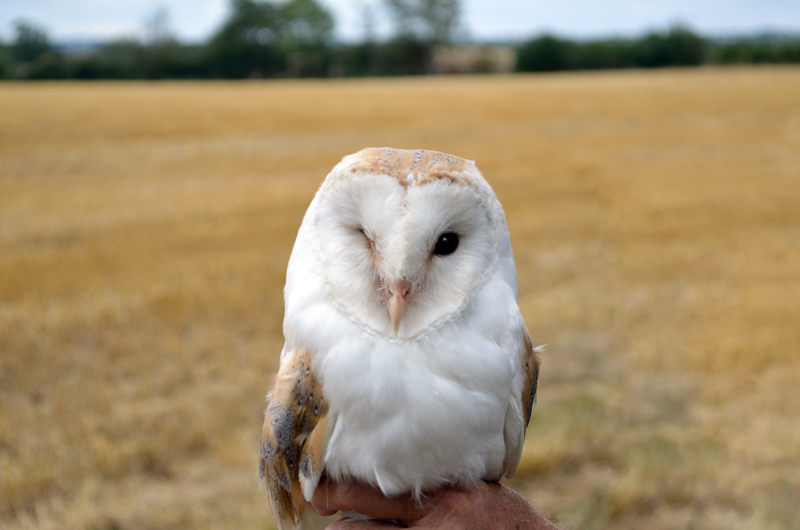 You’d think that losing an eye would hamper a barn owl but this resilient individual seems to have coped rather well. Barn owls need to take about 4 prey items a day to survive, so this male will have been hunting successfully feeding himself, the female and any owlets that they have reared. Barn owls primarily use hearing to locate their prey, their facial disc directs sound towards their very sensitive ears which are located just behind the eyes, or eye in this case! The ears are shaped differently from each other and one is also set higher than the other, this enables the owl to locate prey with a high degree of accuracy. For most predators, the loss of an eye would lead to a terminal decline, but not this hardy male! . Norman put a ring on the bird, for gaining information in the future about this individual. We look forward to returning to this nest box in the spring to check on his progress.